Single 1.5 gal. Satellite Brewing System with 1/1.5 gallon server included. The Gemini System 120A conveniently and automatically brews 12 or 24 cups of rich, fullbodied coffee per cycle into a 36-cup insulated Satellite Server. A brew-ready light signals when water temperature is ready for the next brewing cycle. Timer can also be set to brew 24 cups at a time without refilling the brew basket. This full-featured brewer conveniently plugs into a conventional 115V wall outlet. 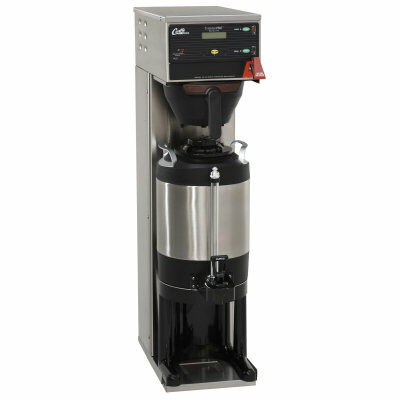 Brews automatically in 12- or 24-cup increments. 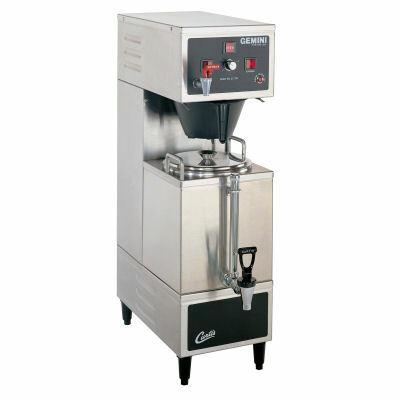 Automatic timer allows brewing of 24 cups without brew basket reloading. High-efficiency, double-wall insulation in each Satellite Server maintains coffee temperature for extended periods without warming. Coffee cannot deteriorate, but maintains its rich, full-bodied flavor. Locking Satellite lids guard against accidental spills. Hot water faucet lets you draw steaming hot water for tea, soups or cup meals – even during brewing. This brewer does not come with the legs shown in the picture. It comes with short rubber bumpers.